Delve into Taiwan’s historical heart—and exploring its rolling hills and riverside scenery on two wheels—when you set off on a small-group bike tour of Houtong and Jiufen. Following morning pickup from your hotel, leave the city behind and head into the countryside. Don’t worry about logistics: all cycling gear is provided, so you can set off without delay. 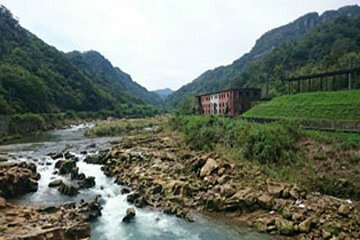 Ride along a historical railway-turned-bike-path, continue past rivers and caves, stop at the Houtong Cat Village, and more. You’ll also wander the atmospheric streets of Jiufen. Great day out of the city---our guide Alex of Taiwan Cycling, picked us up at 830 am, took us on a roughly 25 km bike ride around Houtong, which is an hour's drive out of Taipei...the scenery is beautiful...much of it is by the river, over old railway tracks, through an old coal mining town, and ends at Houtong, also known as Cat Village, where the tourists come for the cats kinda fun too. The afternoon was spent at the old town of Jiufen---a little toursit-y, but good for eating and buying souvenirs/gifts. Highly recommended.